Explore the “Live Entertainment Capital of the World” while enjoying the comforts of home at The Suites at Fall Creek. Surrounded by the rugged beauty of the Ozark Mountains, The Suites at Fall Creek offers a lakeside haven overlooking the White River Basin. 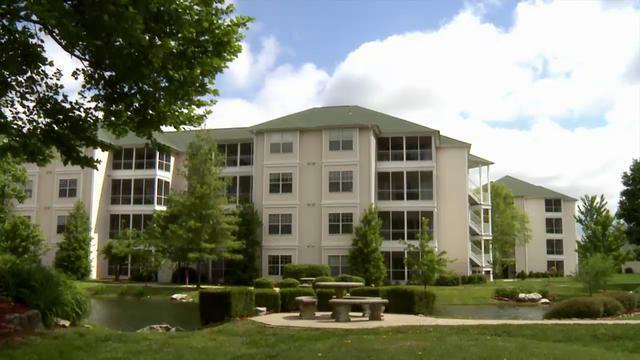 The resort is conveniently located near downtown Branson’s entertainment district and dozens of dining options. Explore the outdoors or enjoy a show, and then return to the spacious accommodations that feature well-appointed amenities. Discover comfort in our picturesque accommodations featuring a queen size bed and full bathroom complete with a complimentary amenity kit. Enjoy the convenience of the partial kitchen equipped with a refrigerator, microwave and coffee maker among many other appliances. Additional in-room amenities include Internet, flat screen TVs, cable/satellite television, telephone and air conditioning. Discover comfort in our picturesque accommodations featuring a king size bed and full bathroom complete with a complimentary amenity kit. Enjoy the convenience of the full kitchen equipped with a refrigerator, microwave and coffee maker among many other modern appliances. Additional in-room amenities include Internet, flat screen TVs, cable/satellite television, telephone and air conditioning. Size: Approx. 900 sq. ft. Discover comfort in our picturesque accommodations featuring a queen size bed and full bathroom complete with a complimentary amenity kit. Enjoy the convenience of the full kitchen equipped with a refrigerator, microwave and coffee maker among many other modern appliances. Additional in-room amenities include Internet, flat screen TVs, cable/satellite television, telephone and air conditioning. Driving: From the North, take Hwy 65 South to Branson. In Branson follow Hwy 76 West to Hwy 165/Gretna Road, turn left and continue 2.7 miles to the Suites at Fall Creek Resort sign. From the South, take HWY 65 North to Branson. In Branson follow Hwy 76 West to Hwy 165/Gretna Road, turn left and continue 2.7 miles to the Suites at Fall Creek Resort sign. Directions to Resort: From the airport road turn left onto Chestnut Exp (Rt. 266). Exit onto I-44 east toward St. Louis, and after about 8 miles take Hwy 65 south to Branson. In Branson follow Hwy 76 west to Hwy 165/Gretna Road, turn left and continue 2.7 miles to The Suites at Fall Creek resort sign. Majestic waterfalls and hemlock-covered forests glisten beneath the breathtaking sunrises and legendary blue mist of the Ozark Mountains. The uncrowded mountain and lake retreats of the Ozark Mountains present spectacular vistas of forests and trails at any time of year. When you want good old-fashioned family fun, head to Branson for a holiday with a touch of Americana. Housekeeping Service: Daily housekeeping services available for a fee. Details: Outdoor Pool Hours 8 am - midnight. Indoor Pool Hours 8 am - midnight. Hours are subject to change. Prior to checking in: Please note that every attempt will be made to accommodate requests for room location and early arrivals but these requests are based on availability and occupancy. Unfortunately, the resort is unable to guarantee room location. Minimum age requirement for check in is 21 years of age. Pets are not permitted at this resort (strictly enforced) with the exception of Service Animals (i.e. Seeing Eye Dog). Please note that none of our studio accommodations are handicap accessible. Elevators are based upon availability. Limited entry level accommodations. 24-hour front desk and security. Upon arrival each accommodation is provided with a first-day starter pack of coffee, creamer, etc. Additional packs may be purchased at the front desk reception. Please note that the outdoor pool will be closed for the season and will reopen in March. The indoor pool will be available for guests enjoyment. - Photo identification and a major credit card deposit of $100 is required (no cash will be accepted) for all reservation types. Please note all exchange and hotel guest reservations (including owner and member rental) will include a nightly $9.95 + tax resort fee. The resort fee is complimentary for all week owners and member point bookings. This fee will cover your access to Wi-Fi, recreational facilities, indoor/outdoor pool, fitness room, mini golf and boarding pass printing.